In 2011, the Zero Discharge of Hazardous Chemicals Programme (ZDHC Programme) was formed to reduce and eliminate the discharge of hazardous chemicals for all products and all pathways in their supply chains. The purpose of ZDHC Foundation is to promote, govern and oversee the implementation of programmes, projects and activities for the widespread implementation of sustainable chemistry and best practices in the textile, apparel and footwear industries. The ZDHC Programme recognises the value of addressing hazardous substances that may be discharged into the environment during the manufacture of materials used in the textile, leather and footwear industry. The discharge of wastewater containing hazardous chemicals can have a significant impact on the environment and human health. Through the ZDHC Wastewater Programme, in Dec 2016 the ZDHC Foundation published ZDHC Wastewater Guidelines a harmonised set of wastewater parameters, limit values and test methods, which will ensure brands and suppliers are working to the same set of expectations. 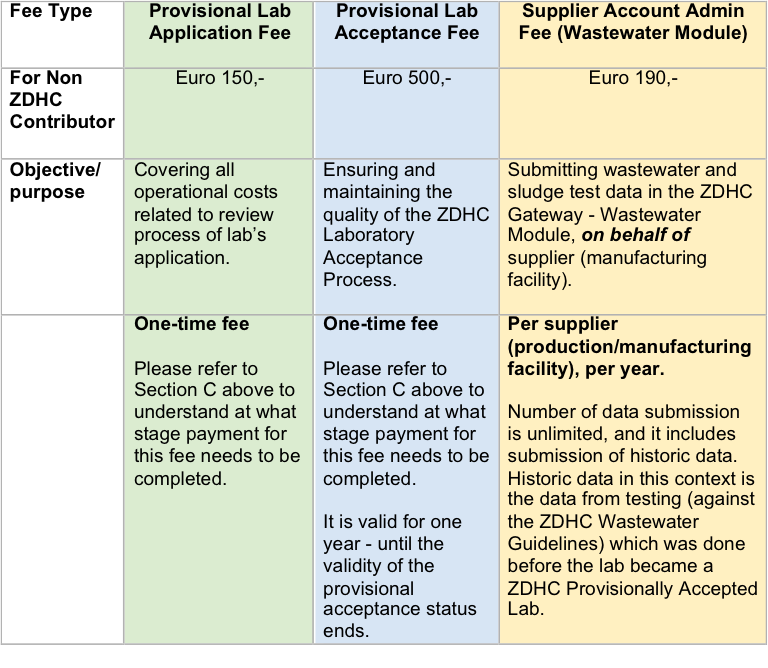 In order to support the ZDHC Foundation purpose and the ZDHC Wastewater Programme, ZDHC Foundation has developed ZDHC Provisional Laboratory Acceptance Process. Laboratories used for wastewater and sludge analysis for the purposes of submitting data on behalf of the suppliers (manufacturing facilities) in the ZDHC Gateway - Wastewater Module, must be provisionally accepted by ZDHC. This is to ensure a consistent level of quality for the test data submitted. ZDHC acceptance means that the laboratory has the personnel, equipment and processes in place to analyse wastewater and sludge samples, but it does NOT give any assurance that for any given sample the data are acceptable. That can only be assured by examination of the associated quality control samples. The ZDHC Gateway – Wastewater Module is a global web-based platform that is designed to share verified wastewater and sludge test data based on testing against the ZDHC Wastewater Guidelines. It will provide suppliers (manufacturing facilities) with an easy way to disclose wastewater data with their clients (brands/retailers), rather than responding to clients’ requests one by one, with the assurance that their data is secure. This document describes the criteria, process and procedure to grant provisional acceptance to laboratories that are analysing wastewater and sludge samples associated with the ZDHC Wastewater Guidelines. This provisional process will be amended on a later stage based on the work of the laboratory advisory group and development of harmonized data quality objectives by the laboratories. 1. The laboratory fills out the Application Form (see ANNEX A) and list relevant certifications as well as reporting limits and method detection limits for each of the parameters. 2. The completed application form with the required supporting documents are submitted by the laboratory to ZDHC for review. 3. The lab settles the payment for provisional application fee (see Section H). a. Analytical methods and quality assurance manuals. b. Example hardcopy and electronic reports. a. If a provisional acceptance status is granted by the ZDHC, the lab will be requested to settle the payment for the provisional acceptance fee (see Section H), and to sign the provisional acceptance agreement/contract. Once both of these two elements are completed, ZDHC will officially announce the provisional acceptance status of the lab. b. If ZDHC did not grant an acceptance, ZDHC will submit to the lab corrective actions required that would help them on the path to ZDHC acceptance. 6. ADEC* will create a profile for each ZDHC Provisionally Accepted Lab in the ZDHC Gateway – Wastewater Module. Once the lab profile is created, the accepted lab could start the data submission process. (*ADEC is the technology service provider who helps build and maintain the ZDHC Gateway platform). a. Accreditation according to ISO 17025 is required for at least 50% of the required testing methods. b. For test methods that are not accredited the lab should show capability by participation in a correlation test or by submitting relevant validation data. a. Accreditation according to ISO 17025 is required. b. Lab should have the 11 ZDHC MRSL parameters accredited (mentioned in the certificate) disregarding the matrix (so it could be in textiles). c. Self-declaration of experience testing the 11 ZDHC MRSL parameters in water and sludge. d. Self-declaration to follow the harmonized ZDHC SOP for the 11 ZDHC parameters. e. Submitting validation data and QC data on demand. f. Participation in commercial available correlation tests. We understand some laboratories do not have the capability to test all the parameters indicated in the ZDHC Wastewater Guidelines. Here is the basic principle in case you need to subcontract the testing for some of the parameters. 2. Making sure all the provisional acceptance criteria and requirements are met and fulfilled by both the primary lab and its subcontracted lab(s). The primary lab is the one who is responsible to collect and submit the complete wastewater and sludge test data in the ZDHC Gateway - Wastewater Module. The list of parameters to be analysed and reporting limits are provided in the ZDHC Wastewater Guidelines which is available publicly on the ZDHC website - click here. The hardcopy reporting template will be shown in ANNEX B. Please note: this is still in development and yet to be completed. The electronic data reporting requirements will be shown in ANNEX C. Please note: this is still in development and yet to be completed. The application and acceptance process is to be completed on a laboratory facility level (instead of on lab company group level), and therefore ZDHC provisional acceptance status will be granted on laboratory facility level. The ZDHC Lab Provisional Acceptance status is valid for a period of one (1) year from the date of acceptance.